Until recently, Motorola’s Moto Maker was only for the original Moto X. You could change the colour of the back, the front, the metal accents, and even add a custom engraving to the back. 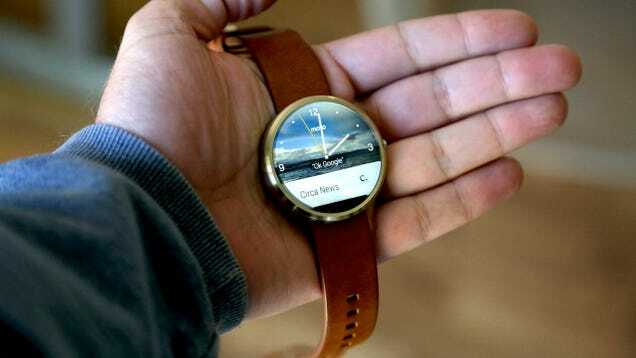 Well, Moto is back at it but this time with the Moto 360 smartwatch. Let’s check it out. When you arrive at the Moto Maker site, you’re greeted with the watch, centre stage. On the left are the three things you can tweak (yes, that’s far few options than you have with the Moto X, but hey, it’s a watch). Click on the Case tab, and you’ll have options for the light finish (silver), the dark finish (black), or the new Champagne Gold. The gold will cost you an additional £50, because hey, champagne isn’t cheap! Next up, we have the Band tab. Here you choose the colour and materials for your watch strap. In the 22mm width leather straps you have the option for gray, black, or brown. For £30 extra, you can go with a 23mm metal band in the same three colour options you have for the case above. Pro-tip: Do not get a gold case with a silver band. It will look stupid. You can also get a thinner, 18mm metal band in silver or gold, but I don’t recommend it. The thinner band makes the watch itself look gigantic, whereas the 23mm matches its size better. Last tab is the Watch Face, which seems a liiiiittle like they just threw it on there just because they wanted to give people something else they could tweak. I mean, it’s not like it’s a permanent watch face; it only takes like 5 seconds to changes faces in Android Wear. Anyway, you can choose between six light faces and 5 dark ones, and when your watch arrives that will be your default face. Ultimately, you’re probably just going to download a cooler face from the Google Play Store, but I guess it’ll look nice coming out of the box if you’re giving it as a gift. Ultimately, I decided to go with the gold case with the brown leather strap. I was tempted to go gold all the way around, but there’s a good reason to reconsider the metal bands: The heart rate monitor. The Moto 360 has a built in HRM that is constantly keeping an eye on your ticker. For it to be able to do that, it needs good, solid contact with your skin, which means you need to wear the watch reasonably snug. Metal bands aren’t made to be worn snugly. They cannot expand and contract like your wrist does, and the sharp edges dig into your skin. This probably isn’t exclusive to the Moto 360 by any means—I’m positive the Apple Watch will suffer the same thing—but it’s something to be aware of.